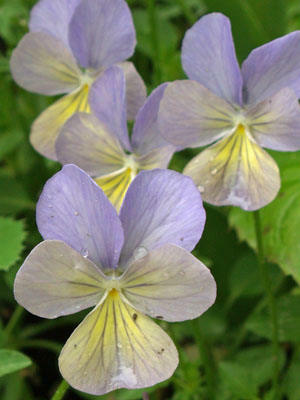 Combine petite violas with other hardy annuals such as cineraria or dianthus. Violas also combine well with chrysanthemums, marigolds and other popular autumn flowers. When starting viola seeds indoors in late summer, barely cover the seeds with moist seed starting mix. Grow the seedlings under bright light until they are large enough to transplant outdoors. Most gardeners save time by buying violas as bedding plants.